The cheer rang out from the crowd of Wabash students just before the final horn sounded and the Little Giant basketball team had secured a 68-57 victory over the DePauw Tigers at Chadwick Court Wednesday night. The victory ended a seven-game winning streak by DePauw and gave Wabash a victory in both football and basketball in the same season for the first time since 1993. The Little Giants brought the Monon Bell, heard ringing in the background throughout the basketball game, with a 17-14 victory back on November 12. Click here to see photos from Wabash's victory over DePauw. Wabash had to battle back from an eight-point deficit with six minutes left in the first half. Back-to-back baskets by Adonis Joseph, including a three-pointer with 4:54 showing on the first half game clock, trimmed the lead to three points. A driving layup by Michael Woods made it a 23-22 Tiger lead before free throws by Reid Sakel put DePauw back in front by three. Andrew Zimmer made it a one-point contest with his jumper in the lane. Then freshman Brian Maloney brought the crowd to its feet with his layup with 2:20 left in the half to put Wabash up by one for the first time in the contest. The Tigers would draw even at halftime, hitting one of two free throws to knot the score at 28-28 at the break. After struggling in the shooting department in the early going, the Little Giants managed to get hot in the final minutes of the first half, eventually hitting 12-of-27 for 44.4 percent from the field. DePauw found it tough to get off good shots against the Wabash defense, connecting on only 10-of-30 attempts for 30 percent. The Tigers also struggled from the free throw line, hitting 6-of-11 from the charity stripe in the opening period. Wabash jumped out to a five-point lead in the first minute of the second half, only to see DePauw eventually tie the score at 35-35 with 15:40 left in the contest. After trading baskets, Kyle Medeiros drilled a jumper, then Maloney stole the ball at midcourt and found Woods all alone at the three-point arc. The long-range basket by Woods made it a 42-37 contest in favor of Wabash. The Little Giants pushed the advantage to eight points with 9:19 left before DePauw would cut it to three points just two minutes later. Free throws again became the difference in the contest. Wabash hit 4-of-4 from the stripe over the next three minutes, while the Tigers were just 1-of-4 along with a missed three-pointer to give the Little Giants a 57-51 lead. DePauw’s Matt McDonald ended the scoring drought for the Tigers with a layup to cut the lead to four. It would be Medeiros who would come up with the first of two back-breakers for Wabash. After Medeiros missed a jumper in the lane, DePauw’s Michael Moore had the rebound knocked out of his hands underneath the Wabash basket. On the ensuing inbound play, Medeiros stole the entry pass and scored an easy layup to give Wabash a 59-53 lead with 2:16 left. It proved to be a key basket when Alex Stewart answered for the Tigers with a three-pointer five seconds later to cut the lead to three. After free throws by Kyle Coffey and Woods, it would be Joseph’s turn to provide the final big play. Leading by five points after DePauw once again hit only one out of two free throw attempts, Joseph drilled a three with the shot clock winding down to put Wabash up 65-57. Caleb Lyttle added a layup with 19 seconds left then hit one of two final free throws to give Wabash its first victory over the Tigers since an 87-81 win by the Little Giants in 1998 in Greencastle. It was the first time Wabash had claimed a victory at Chadwick Court since defeating DePauw 82-65 earlier in the 1998 season when the two teams played twice a year as part of the Heartland Collegiate Athletic Conference. Medeiros finished with a season-high 19 points on 7-of-15 shooting. Coffey recorded his first double-double of the season and fourth of his career with 10 points and 12 rebounds after going scoreless with only two rebounds in the first half. Joseph also had 10 points in the game. Wabash finished 25-of-61 from the field in the contest while holding the Tigers to just 19-of-55 shooting (34.5 percent). Wabash (3-3) will open North Coast Athletic Conference action Saturday afternoon against the Oberlin College Yeomen (0-6). Oberlin lost 82-51 to Defiance Wednesday evening. Tipoff for Saturday’s game is at 2 p.m. at Chadwick Court. 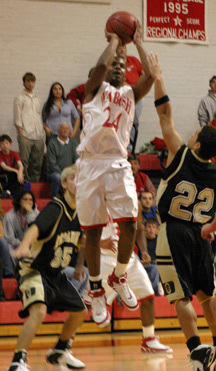 Top left - Adonis Joseph's three-pointer with 32 seconds left in the game gave Wabash an eight-point lead. Bottom right - Kyle Medeiros hits one of his seven baskets in the game. 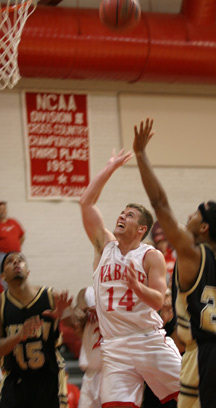 The senior guard led Wabash with 19 points. Sports home page - Senior Caleb Lyttle drives for two of his seven points in the Wabash victory.